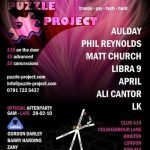 June’s edition of Puzzle Project certainly went with a bang – a month of true firsts! 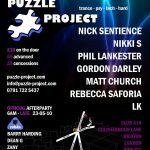 SWAP made his Puzzle debut with a set of awesome trancey treats, our brand new resident Andi Leppard introduced . . .
Wow! Last month’s party was a huge success, with all the DJs causing some serious dance floor May-hem! Thanks to all the clubbers who made it down to the 414 to dance their little hearts out, and . 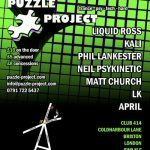 . .
April saw another cracking Puzzle Project party, with top notch sets from our guests Mark Day, BSE and of course our trusty residents taking the roof off the 414. For this month’s party we’ve decided . . .
Last month saw yet more proof of our dedication to bringing you the finest DJs playing top notch music, as well as new artists doing erm… exactly the same. 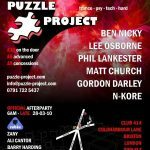 Massive thanks to Ben Nicky, Lee Osborne and . 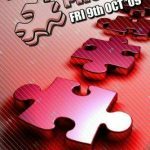 . .
Not a lot to say about last month’s Puzzle Project except for ‘Wow, that’s what we call a party!’ We were well chuffed with how many people turned up out of the sheet rain that was drenching South . 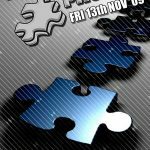 . .
As many of you will be aware we have now moved from our previous Friday night slots to the fourth Saturday of every month at our beloved home, Club 414 in Brixton. If you weren’t able to attend our . . . Many people consider a new year to be a time to make changes and re-invigorate themselves with the implementation of fresh ideas. Being no exception to that we’ve made a few refinements ourselves with . 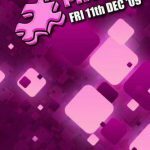 . .
As we prepare to wave farewell to 2009, our unceasing mission to provide you, the clubber, with top quality acts, awe-inspiring visuals and intelligent musical progression continues. It’s naturally a . . .
We’d like to say a big “thank-you” to all those who attended our October event. 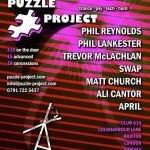 We hope you had as much fun as us, celebrating Puzzle Project founder/resident Phil Lankester’s birthday! The 414 was . . .
Firstly, thanks to all those who joined in making last months 4th Birthday celebrations such a resounding success. Not only was a packed 414 the ideal setting to blow out the candles on our cake it . . .